Unique Moments Photography did not have to travel far for this one. We LOVE capturing weddings right in our hometown of Gig Harbor Washington. Jessica and Justin told us about this wedding and its one we have really looked forward to photographing. They have a friend who had acres of property on the key peninsula and they let them use the property for their wedding. Wowzers !!!!! Talk about NOT having to break the bank for your wedding. However, Justin probably broke his back a few times getting the property ready for the wedding. He spent a week at the property getting it all cleaned up and ready for family and friends. What a fantastic job he did. Family and friends were treated to a unique Washington styled wedding deep in the forests of the Key Peninsula. The location was simply beautiful. We were so excited when we saw the property. 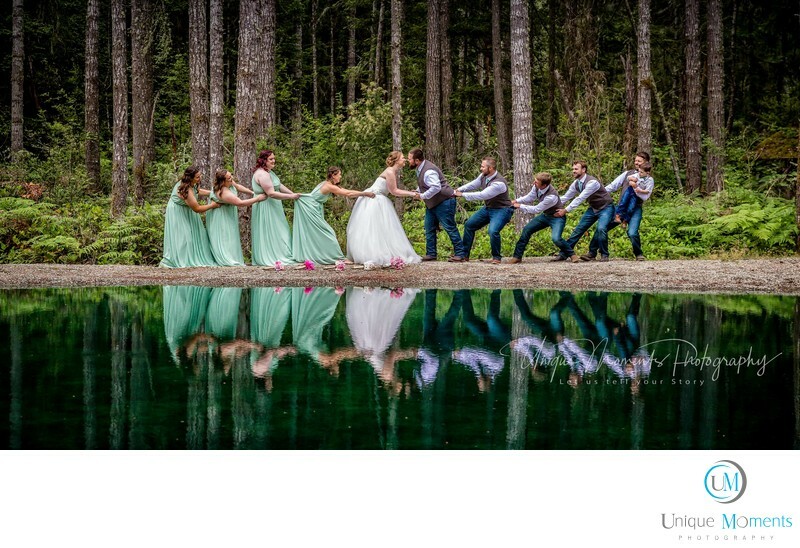 We captured some of the most unique Washington photos we have captured to date and our ” Tug of War ” shot was the best capture in the history of our company. This one will get submitted to a print competition. Everyone just had a great time capturing images at this location. Weddings do not have to be super expensive nor be held at expensive venues. This wedding had every element that any wedding has. We had two families that came together to celebrate this beautiful marriage of this couple, and it was held outside in a beautiful setting. It was simply a wonderful day for everyone involved. We were so honored to capture this wedding. Its one of our favorites for the 2018 season and we cant wait to see what photos Jessica and Justin pick out for their album. This album will be one we will feature and show other couples. We loved everything about this wedding. What an awesome day and awesome families to be with. Location: 7116 Stinson Ave Suite A207 Gig Harbor Wa 98335 .